We welcome Teams for training and for Coaching! Skydiving is becoming increasingly more competitive and at Skydive Algarve we can help you become the best, with great facilities, a fast turnaround, and opportunities to train alongside other professional teams. Skydive Algarve is pleased to welcome teams during their training. Please be assured we will do everything we can to make sure your trip runs as smoothly as possible. The Swallow Group drop zones are home to the Satori Academy, which offer 4-Way FS competitive team training camps for skydivers of all levels. Founded in 2007 by team Satori member Julia Swallow, herself a Female 4way FS Women’s World Gold medal winner, team Satori have had success at both national and international levels, most recently being the gold medal winners at the British Open 4 way FS skydiving championships 2015. Lead by highly experienced skydivers of world competition level, the Academy brings together the best skydivers to build teams and compete, entering them into national and European 4-Way competitions. It is a fantastic way to be part of a team and receive a world-class level of formation skydiving team coaching. Try-outs take place annually in the tunnel each November. Team Satori is also available to coach your skydiving team at any of our three dropzone locations in Spain, the UK and Skydive Algarve. We understand getting here with all your gear, under the limited luggage allowances airlines now impose, can be tough. So all you need to bring is your empty weight belt. We have 2lb weight pouches available, they are standard size and free to use during your team training camp. You will need to pay a deposit of €10 which will be refunded to you on return of the pouches. Please advise us in advance of your trip by emailing info@skydivealgarve.com if you want to hire weight so we can have sufficient pouches available. The Swallow Group also own two additional drop zones. 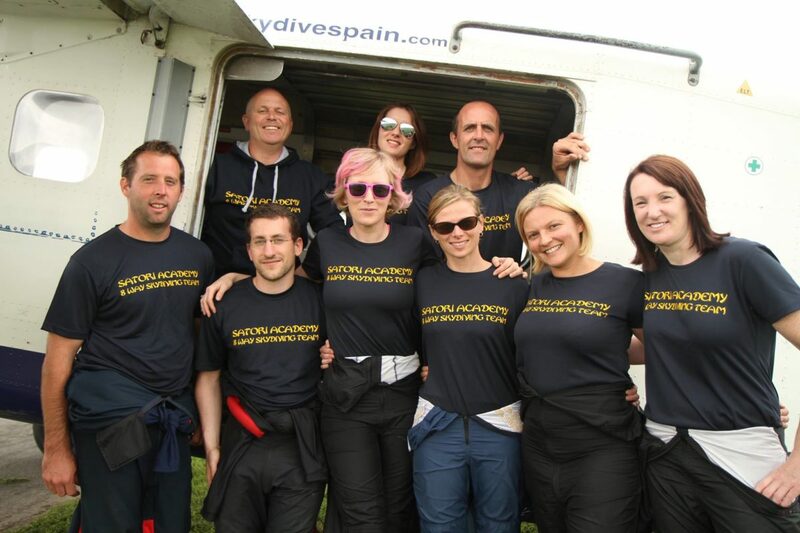 Skydive Hibaldstow in the UK and Skydive Spain in Seville where they have an established team training programme. If you are looking to commit to camps at multiple Swallow Group dropzones for the season, or simply want to try somewhere new, then please get in touch.